A great recipe for those who like to layer flavors! Prep it ahead of time and let the cool of the fridge do the work for you. 1Combine the marinade with the chicken breasts in a plastic bag. Seal and toss to coat the chicken evenly. Let marinate in the fridge for at least 3 hours. 2Meanwhile mix all the Mexi-Ranch ingredients together in a medium bowl. Cover and refrigerate until ready to top the chicken with it. 3When you're ready to cook the chicken, turn the broiler to high and remove the chicken from the bag. (Discard the extra marinade.) Arrange the chicken flat in a large baking dish. 4Broil for about 6 minutes each side, or until the juices run clear. 5Spread the Mexi-ranch over top of the chicken and sprinkle the cheese on. 6Broil for 2 minutes more, or until cheese and sauce begin to bubble. 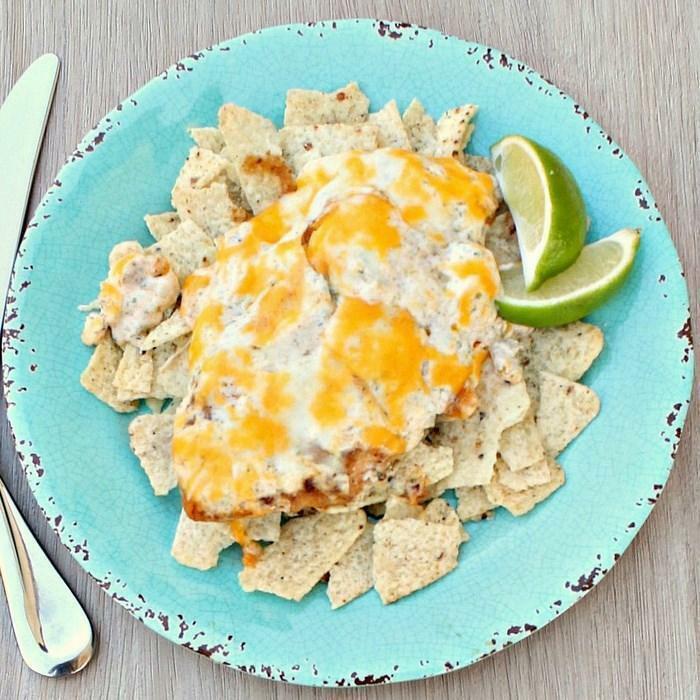 7Serve over tortilla chips and drizzle fresh lime juice over the top.